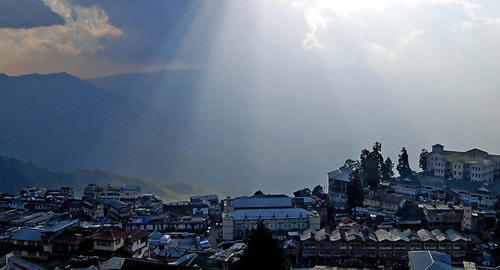 Nature at its spectacular best sprinkled with elements of modern development, bustling hill bazaars, fisheries and karkhanas enchant you as you spend your honeymoon stays in Shillong at a fascinating country cottage. See dahlias, forget-me-nots and roses of all colors and sizes grow in profusion all over Shillong, spot the rarest of ferns and orchids grow in wild tufts all over splendid Shillong as you honeymoon in this splendid hill honeymoon land that invites you into its hill contours alive with murmuring hill streams and rare bird life. Honeymoon tours in Shillong offer you the ideal opportunity to visit the enchanting attractions of Cherapunjee, Jakrem and Mawsynram. Shillong is well connected by road to Guwahati, the capital city of Assam, East India.